Maybe because the new apartment has a lovely courtyard, or maybe because in Chicago we truly savor warm, summer days, but I've got al fresco dining on the mind! Nothing reminds me to slow down and be thankful like sitting outside, enjoying delicious food and wine, and watching the sunset between good conversation and laughter with friends and family. When I need a little tabletop inspiration, I turn to these three very talented ladies who bring style and beauty to everything they touch! 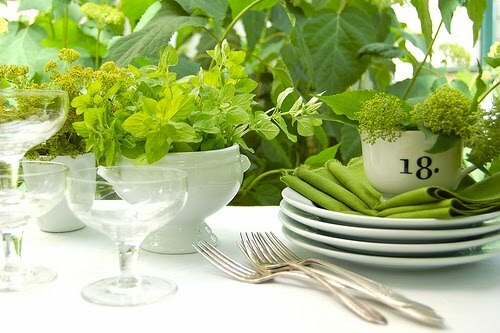 I love Sharon's use of a hosta leaf for a placemat! What a creative idea. 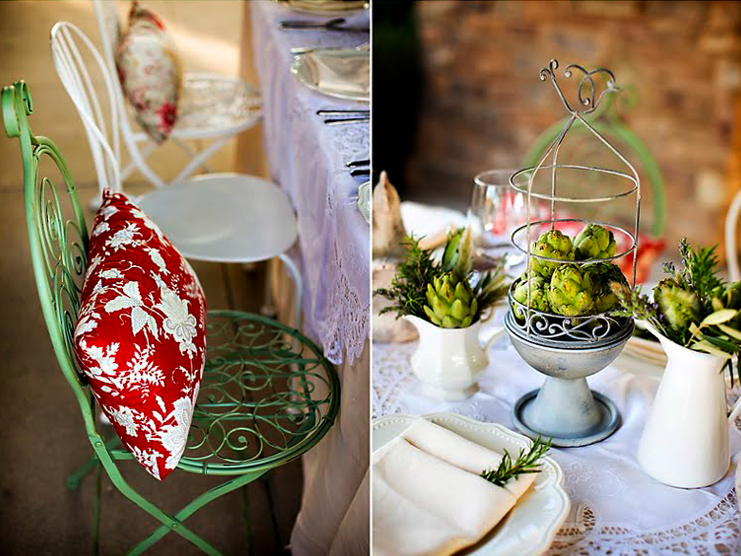 Carissa's tabletop got my attention for the artichoke centerpieces and mismatched chairs. 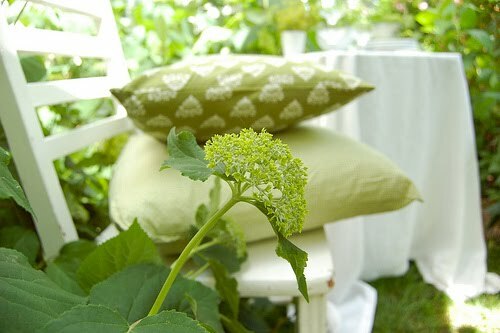 The simple color palette of green and white in Chelsea's design was love at first sight for me. What a statement those two colors make! Each of these beautiful designs remind me to make the most of summer while it lasts because soon we'll be trading in the long, warm days for shorter, cooler ones. And speaking of which, I'm so excited to announce tomorrow's guest, the lovely Anne Sage of The City Sage, for our fourth and final installment of, Fall: Get Ready / Get the Look. Hope to see you tomorrow - you won't want to miss it! 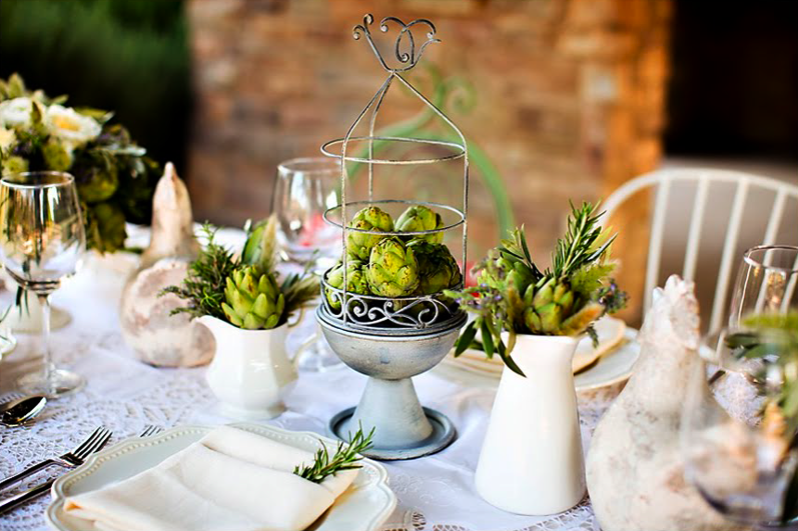 Oh love the look of the artichokes on the table and love to eat em too!!! can't wait to see your new place, how exciting! GORGEOUS!!! im so glad i found your blog!!! 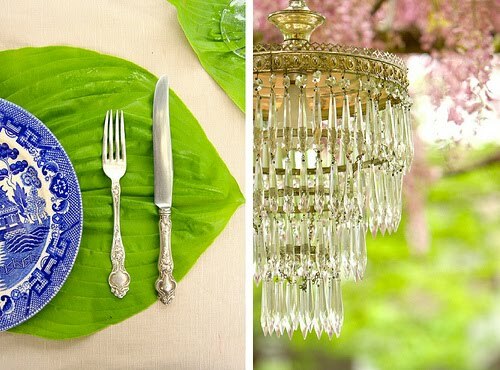 That first image is one of my all-time favorite tablescapes! It was my inspiration of the week a few months ago, and I keep returning to it for inspiration! I love seeing the rest of her work... just WOW! 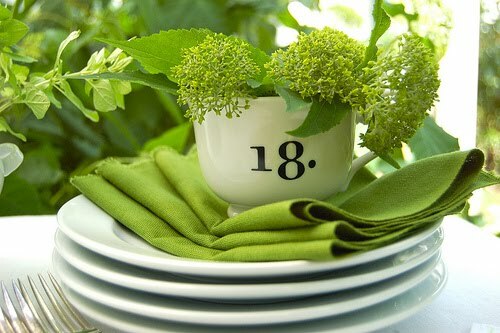 What beautiful table decor. Love the use of green. So fresh and lovely. Very nice pics! Gorgeous!! That wysteria tree reminds me of when I was a girl. My mom planted one outside my bedroom window, so whenever I woke up it was the first thing I saw. 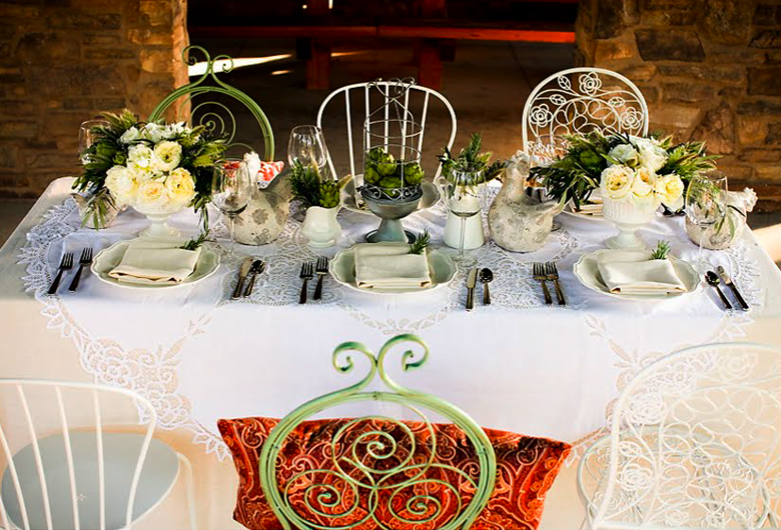 They are all gorgeous tablescapes, but I find myself drawn to Sharon Taylor's design. 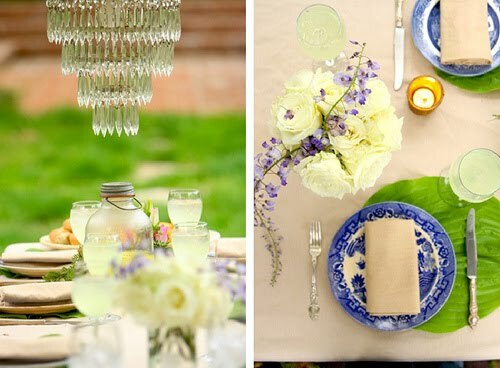 I love how the chandelier adds a touch of elegance to outdoors, and that hosta placemat...how perfect! The chandelier hanging amongst the awning trees is super fab! The mismatched chairs are also hawt! Green and white will forever be my favorite color combination. The last table setting is an absolute dream. 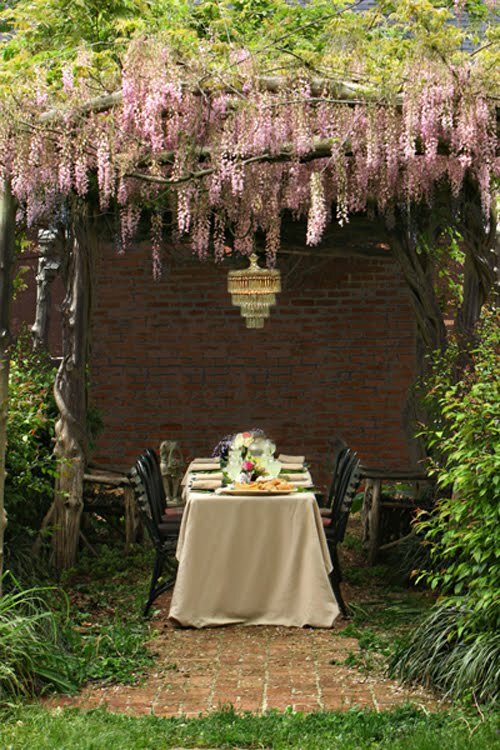 That wisteria is magical! What a beautiful place for a twilight dinner party! Every single photo is absolutely gorgeous! Lovely detailing! I am in love with that Sharon Taylor table top. Love it! Loving this table top escape. Now how can I recreate the table under the trees? Gorgeous! I love Sharon Tayolor's use of the leaves. They blue plates look so fresh and vibrant against the green. Love it.